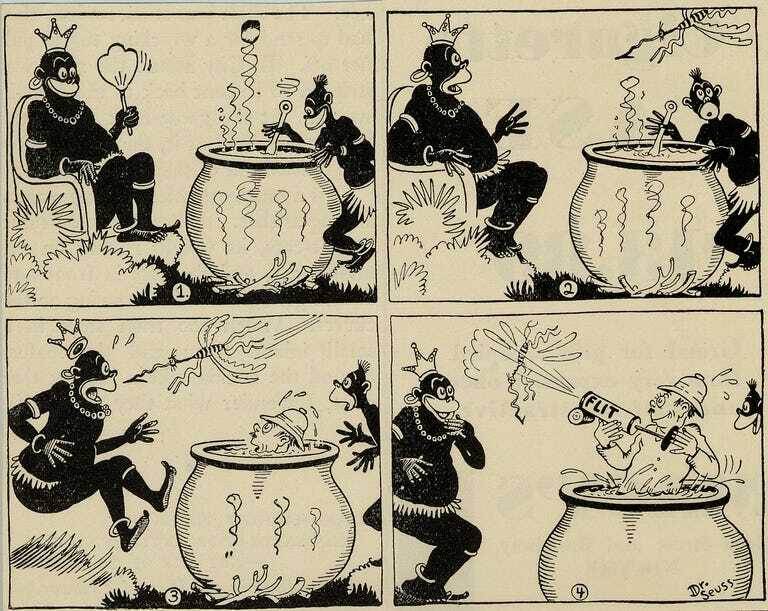 Is Dr. Seuss, the man who wrote and illustrated many of the most beloved children’s books of the 20th century, actually racist? To millions of grownups who were raised on Seuss books such as The Cat In The Hat, Green Eggs and Ham and Horton Hears A Who, the question itself may seem puzzling at first. What was the librarian, Liz Phipps Soeiro, talking about? Why are some critics and scholars now turning against Dr. Seuss for, they say, perpetuating harmful racial stereotypes of both black and Asian people? According to those critics, there may be good reasons. Dr. Seuss, whose real name was Theodor Geisel, died in 1991 at the age of 87 with more than 60 children’s books to his credit. He started using the pen name “Dr. Seuss” as early as 1927, but it wasn’t until 30 years later when he was already 53-years-old that he published the book that made him a worldwide bestselling author and celebrity, The Cat in the Hat. The Cat in the Hat quickly sold more than 1 million copies and remains the ninth-highest-selling children’s book of all time, though it is topped by Seuss’s own Green Eggs And Ham, which comes in at No. 4. In fact, six of the 20 bestselling kids’ books of all time were penned by Dr. Seuss, according to the industry trade magazine Publisher’s Weekly. But before Geisel became world famous for his books, he was a cartoonist whose work often exploited racial imagery and stereotypes that would be considered universally offensive today, and even in their time were clearly intended to demean the racial and ethnic groups he portrayed in the illustrations. For example, the cartoons at this link and at this link now in the collection of the University of California at San Diego, cruelly portray black people as cannibals — who are also infested by bugs (“Flit” was the name of a then-popular insect repellent). 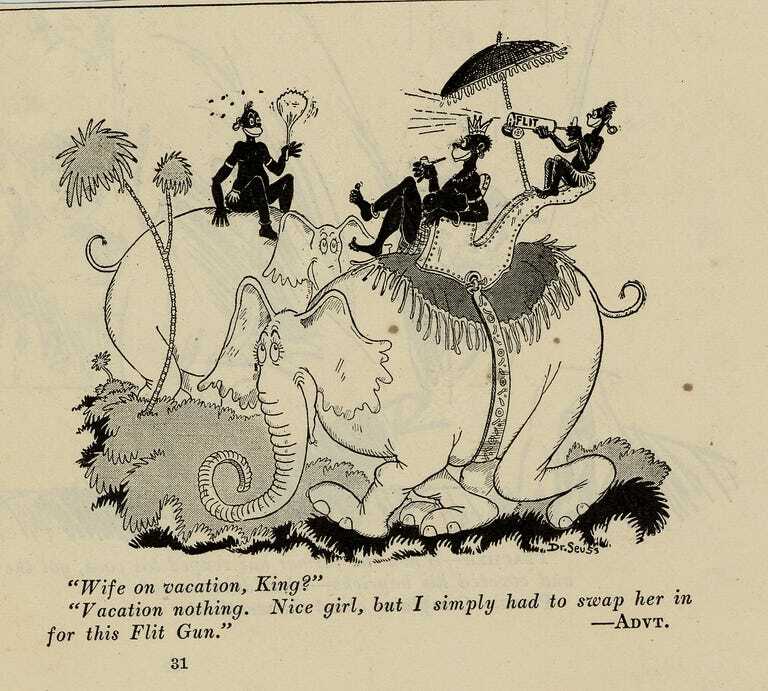 But the stereotyped racist imagery in Dr. Seuss was not confined to his editorial cartooning, according to some critics. Read Ishizuka-Stephens’ entire essay by downloading the PDF file at this link. 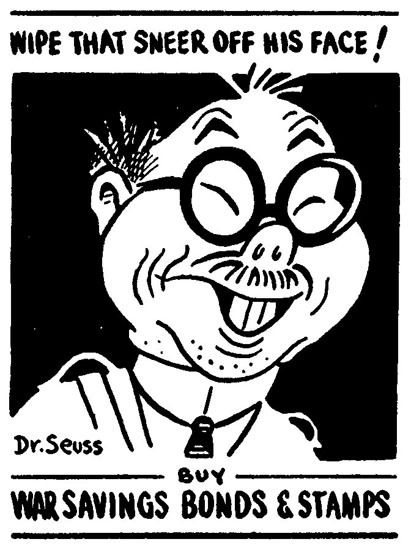 Ishizuka-Stephens says that her grandparents — Americans of Japanese descent — lost jobs and were ultimately sent to internment camps during World War II, and that the stereotypes perpetuated in Seuss’s cartoons helped inflame the anti-Japanese bigotry that led directly to their imprisonment, along with thousands of other American citizens with Japanese heritage during that era. While defenders of the Dr. Seuss books say that Geisel later came to regret at least some of the earlier racism in his cartoons, filmmaker Ron Lamothe who directed the documentary The Political Dr. Seuss isn’t certain.